I know what you’re probably thinking: “Christmas? It’s not even December yet!”- but what use would these tips be if I were to share them on Christmas eve? Besides, November is disappearing before our very eyes, which means before we know it, Christmas and all of the excessive calories and sherry that come with it will soon be upon us. Christmas has long been a very lucrative season for the B2C space and particularly in the retail sector, hence the time dedicated and budget pumped into Christmas adverts (which might I add tend to be published as early as November). However, not all brands can justify spending millions on an advert entailing a CGI boxer named Buster jumping on a trampoline. If you haven’t checked out John Lewis’ advert yet, you can do so here– prepare for a chuckle. After all, many of these consumer focused adverts either directly feature their brand’s products, or have a deeper message behind them; often harder for B2B brands to achieve. For example this year, John Lewis left us with a thought provoking message of ‘Gifts that everyone will love’, whilst Sainsbury’s tugged on our heart strings with a message of ‘the greatest gift you can give is you’. 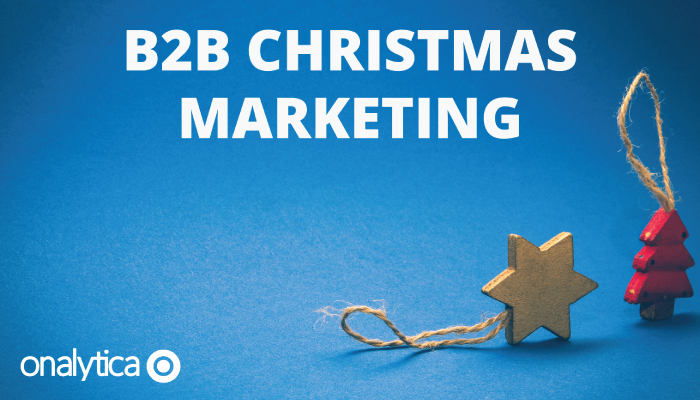 B2B brands typically do not leverage opportunities throughout the festive season in their marketing activities, simply because they’re not too sure what to do and whether it is really worth it. However, before we eat ourselves into a food induced coma, I have 8 tips which B2B marketers can still implement as we head into December. This suggestion is no different to what B2C brands do around Christmas time- think perfume gift sets with a free makeup bag. However, often the free gift we receive is something we otherwise wouldn’t have bought, so whilst the sentiment is appreciated, the consumer may not be benefiting at all. Whilst a current client or prospective client may not be best pleased to receive a free makeup bag, they may be over the moon to receive one of your actual products/software- whatever it is you offer as a brand (for example this could be giving them a month’s free access to your software). Whilst it may be harder to think of exactly what to offer as a ‘gift’, chances are it will be far more useful and relevant to their needs and therefore better received. Let the B2C brands focus on giving novelty stocking fillers, whilst you provide the useful, thoughtful and meaningful gifts that will continue to be useful beyond the Christmas season. Whilst Christmas is a cold, quiet season, you can keep those prospective clients warm and ready to buy in January. The excitement around Christmas doesn’t start on Christmas eve, it commences on the 1st of December as we enter ‘Advent’. While Advent has long been a tradition, it has since like Christmas become very commercial, particularly in the last 3 years with the rise in brands releasing advent calendars featuring their product miniatures. 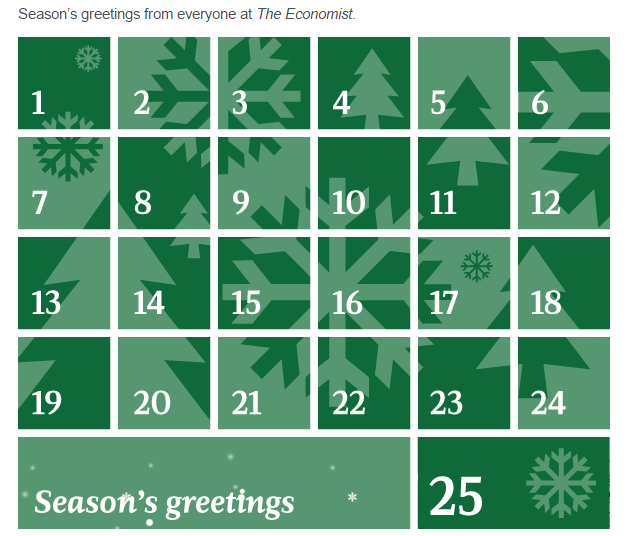 Why not leverage Advent or the 12 days of Christmas to your advantage by publishing a new piece of content every day? Consider influencer or brand collaborations, or revving up internal content. If content is too time consuming, then you could release a new fact or tip every day. This is a prime opportunity to have some fun and get creative in a way that doesn’t jeopardise your professional reputation, all whilst increasing web traffic at a time where web traffic usually takes a hit. A great way to do this is to release a digital Advent calendar, in which behind every door you’re redirected to a blog post, video or tip. An example of this by The Economist can be seen below. We must be careful to not get so caught up in the excitement of Christmas that we lose sight of potential opportunities going into the New Year. If clients have leftover budget, then offer them an exclusive ‘sign up now’ offer. Equally, if they do not have any budget left over, then provide incentive for them to get the conversations started again in the New Year. This goes back to my first tip; offering them something they’re genuinely interested in will be far more effective than offering something pointless for the sake of giving. December means the wrapping up of yet another year, not just the presents under our Christmas trees. Therefore, you should be identifying something you can do as a brand which will be useful to a client as we enter a new year- given your resources. This could be running a free or discounted report on their 2016 activities in a particular area, or helping them to make proposals for the new year. Whilst you may not be selling your core offering, this will appear less pushy and more useful to the client, which could in turn help transition them to being a fully-fledged client. Wrapping up the year also provide more content ideas- think 2016 round ups and 2017 predictions. Email marketing is an area that divides opinions. For most, work email inboxes are inundated with useless spam emails, so perhaps a Christmas marketing campaign isn’t favourable or front of mind. However, as we enter the 20 somethings of December, you may find prospective clients are getting quieter in terms of work load, are in a better festive mood and therefore more partial to a dose of red and green in their inbox. So the time is nigh to get your brand’s name out there and on their mind. This is also the prime opportunity to promote your offers for the new year. Do keep in mind that not all will celebrate Christmas for personal or cultural reasons; keep messaging neutral in terms of religious connotations. It is very easy to overthink this whole process, when often less is more. In a world where we’re all obsessed with technology, sometimes going ‘old school’- for lack of a better term, can be far more effective. Writing personalised Christmas cards to all of your current clients and warm (near) clients will remind them that you’re thinking of them and as a result make them think of you. However, be careful to not make this too branded- a logo will suffice, if anything. Most B2B brands have a presence on social media, making it the preferred area of choice when spending money from the marketing pot on advertising. As more and more people live and work away from their families to pursue their chosen career path, social media has become a popular means for families to keep in touch – particularly at Christmas time. Therefore, advertising on the likes of Twitter and Facebook is far more expensive around this time of year. So, if you’re going to spend more on social media adverts, now is the time to do it! While clients may begin to switch off and be harder to reach going into late December, they may get on board with an opportunity to have some fun. Organising a Christmas get together as an opportunity to not only network but to have a drink and get in the spirit of Christmas, is a great way to generate new leads and keep existing ones warm. If you’re interested to see how influencers can play a part in the above suggestions, head on over to trial our influencer discovery tool here.